It’s time for the Great Food Blogger Cookie Swap recipes! This event was conceived by bloggers Taylor and Lindsay at Love and Olive Oil, along with Julie of The Little Kitchen. Over 600 food bloggers participated this inaugural year. 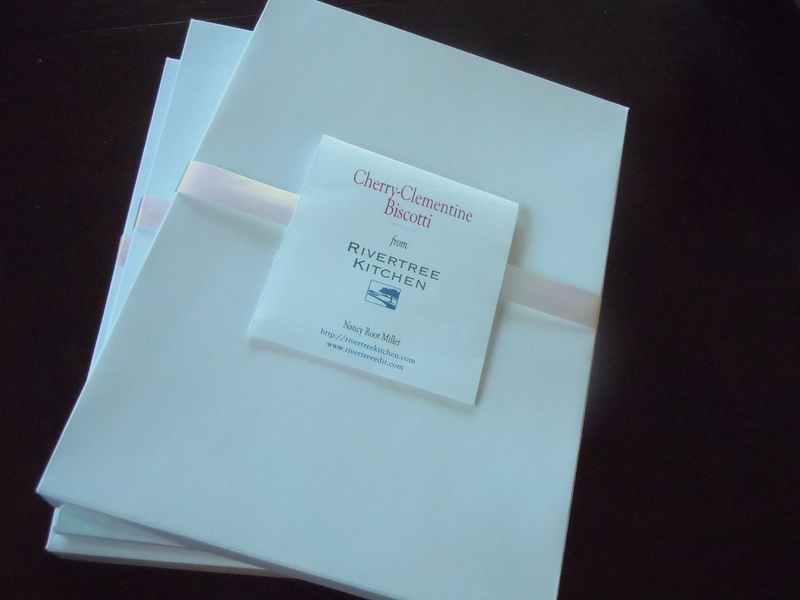 Every participating blogger made one style of cookie and sent a dozen to each of three participating bloggers. We had to work from recipes that we hadn’t posted before. We are all posting our recipes today. There are links to all of us on Love and Olive Oil‘s blogsite. And if you’d like to join next year, go here for notifications on the 2012 edition. 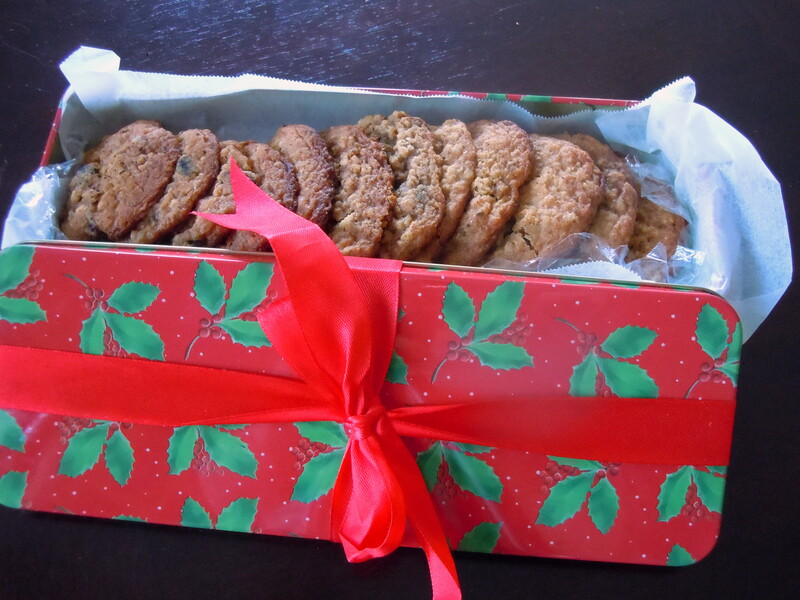 I first received Caramel Raisin & Pecan Oatmeal Cookies from Megan Bailey. They were moist and tender, and richer than you expect oatmeal cookies to be. Even my raisin-averse son loved them. 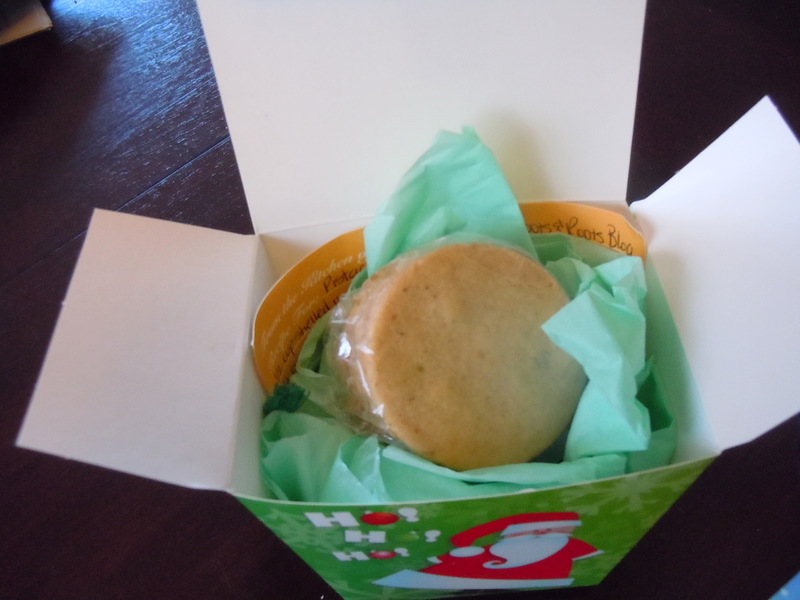 Next to arrive were Melissa Beach‘s Pistachio Shortbread–delicate, buttery and sweet. Melissa suggested using them as sandwiches with a filling of ice cream or Nutella, but they were fantastic in their simplest state. UPDATE: The last batch came this afternoon: Pineapple Cookies from Marcy at Just Crumbs, tender, delicate and yummy. I sent cookies to Teresa of Food on Fifth, Stephanie of Will Run 4 Treats, and Amira and Casey of Hungry Dancers. I know Teresa received my package; I’m hoping the others did as well. The whole experience was tremendous fun. The very best part: now everyone has over 600 cookie recipes at our fingertips. I wanted to send a cookie that would hold up well in transit, and would still be tasty up to a week after baking. My go-to cookie is Not Your Grandma’s Molasses Cookies, but I’ve posted about them already. So I thought a new style of biscotti would fit the bill admirably. Biscotti should be crisp, crunchy, and sturdy enough to dunk in a cup of coffee or tea. They also must be flavorful and buttery. They should not be hard enough to break a tooth. Heat the oven to 350°F. Line a cookie sheet with parchment. Zest the clementines; you want 1 generous tablespoonful. Put the dried cherries into a small bowl. Squeeze the juice of 1 or 2 clementines over the cherries. Set aside to plump up. Stir together the flour, baking powder, and salt in a small bowl. In a larger bowl, beat the sugars, butter, and zest until they’re light and fluffy, 3 to 5 minutes. Beat in the eggs one at a time. Beat in the flour just until it’s incorporated; don’t overmix. Drain the cherries and stir them in (discard the liquid, or drink it — it’s delicious). Divide the dough in half (no need to refrigerate, even though the dough will be sticky). Form each half into a log about 3 inches wide on the cookie sheet. (You can make just one long log, but I find it easier to manage with two.) Forming the logs is easier if your hands are damp. Bake for 30 to 35 minutes, until the logs are just cooked through but not hard, and are pale gold on top. Cool the logs for 20 to 30 minutes (leave the oven set at 350°F). Move the logs to a cookie sheet, and save the parchment-covered cookie sheet. Cut the logs into slices about ¾-inch thick; a sharp serrated knife and a gentle touch work best. Lay the slices flat on the cookie sheet and bake for 10 to 12 minutes longer, until the slices are golden. I bake them for 10 minutes, then gently flip each cookie and bake for about 5 minutes longer. Cool on a cookie rack. If you’re decorating them with chocolate, melt the chocolate with the butter in the microwave for 30 seconds. Stir and microwave again. Continue microwaving for 30 seconds and stirring each time until the chocolate is just melted. Use a small spoon to drizzle the chocolate over the cooled cookies. Or pour the chocolate into a small plastic bag, cut the tip of one corner off, and use it as a piping bag. It’s easier to lick the extra chocolate out of the bowl than out of a bag, though. Just thought you should know. *The final number of cookies is quite variable; it depends on the size of your logs, how much the dough spreads in the oven, and how thickly you cut the cookies. This entry was posted in baked goods, sweet stuff and tagged biscotti, cherry, clementine, cookies, orange. Bookmark the permalink. 10 Responses to The Great Food Blogger Cookie Swap! Wow, your biscotti were a big hit at a photo shoot today. I took them to share with a hot cup of coffee and they were gone before I turned around! I dipped mine in hot cocoa and it was divine. I will look for your books and am happy to get to know you via the “cookie swap”…we will be good blogging pals I just know. Happy December. Teresa, thanks so much! I wanted to make cookies that would still be tasty if they took a week to arrive, and biscotti seemed to be the logical choice. I subscribed to your food blog, and I’d love to keep in touch. So nice to “meet” you, and especially through cookies. I am sorry that you just received your cookies today. I sent them last Monday morning. I knew that the mail was slow out of here, but Geesh! I apoligize again. Marcy, it wasn’t your fault. I still don’t know if two of my packages reached their destinations, and I sent mine on Friday the 2nd. I recommended to the hosts that they move the shipping deadline up to 10 days before the post date. My husband and son ate every single cookie (except for the one I got) last night. They were a big hit. 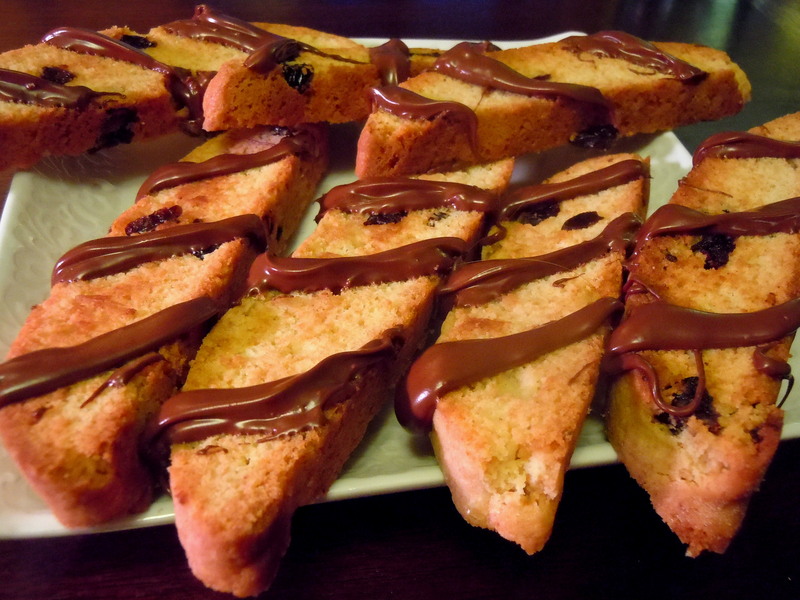 I love a biscotti that is not too sweet and these sound terrific. Thanks, Karen. If you skip the chocolate, they’re almost healthy! Beautiful! I’ve never zested a clementine, but of course! And the cherry would make a nice pairing. Actually, Justine, what I meant was that “mostaccioli” is a pasta dish to me, not a cookie. I just wondered how you came up with that name. I also have an open bottle of red right now, so I think I’ll make them this afternoon.